Nearly every modern electronic device contains at least one printed circuit board (PCB)—a piece of material, such as plastic or resin board, onto which is printed or deposited tracks of conductive soldering material to connect various electronic components such as resistors, integrated circuits, capacitors, transformers, and so on. After all the components have been attached to the PCB, it is then called a printed circuit board assembly (PCBA). The evolving world of electronics demands continuous improvements in functionality, along with even smaller-sized PCBAs. Modern PCBA designers choose between two primary methods for mounting the electronic components onto a PCB: Through hole and surface mount. Knowing more about each method is essential to ensuring you make the right choice for your intended application. The through hole mounting (THM) process involves drilling holes through a bare PCB into which the leads of electronic components are inserted. This was the original process used for assembling PCBAs until surface mount technology (SMT) was invented in the 1980s. Although some assumed THM would become entirely obsolete with the rise of SMT, THM is still used because some of its benefits are still relevant in certain applications. Because the leads are inserted through holes, the electronic components are more solidly connected to the board, which means they are able to withstand much higher levels of mechanical or environmental stress than PCBAs constructed with SMT. If the PCBA will be exposed to extreme accelerations, collisions, or high temperatures, THM is more durable than surface mount technology, which is why THM is used for certain parts in many military and aerospace applications, as well as in connectors and transformers. Moreover, THM components are easier to remove and replace, which makes them ideal for prototyping and testing applications. Holes have to be pre-drilled into PCBs, which is considered to be both expensive and time-consuming. THM boards are also far more limited in the number of components that can be placed onto them, because THM components are larger than SMT components, and can only be placed on one side of the board. In multi-layer boards, the routing area is further limited since the holes have to go through all layers of the PCB. Finally, a THM soldering point tends to be less reliable than SMT solder because of THM’s reliance on wave, selective, or hand-soldering techniques that need to be performed on both sides of the board. In the surface mount technology method, the components are attached by solder directly onto the surface of the PCB. The vast majority of electronic hardware manufactured today contains PCBAs created using the SMT method. Because the boards do not need holes, both sides of a PCB can be used, and SMT components can be very small. This means the main benefit of SMT over THM is a much greater density of potential components. The lack of holes also means significant savings in cost, less waste, and much faster production times. Rapid placement of components – ten times faster than THM – is complemented by a much more reliable soldering technique achieved through the use of reflow ovens. The components on PCBAs constructed with SMT perform well through shaking and vibrating conditions. Problems arise when SMT is used as the sole method for attaching components to a PCB that will be exposed to high mechanical, environmental, and/or temperature stress conditions. This problem can be mitigated by blending the SMT and THM processes to get the benefits of both. More components can be mounted on the board, in part because SMT components are smaller, and in part because both sides of the board can be utilized. SMT overcomes the space problems inherent in THM methods, allowing for ever-smaller and lighter designs that are faster and more powerful. Much higher pin counts are possible with SMT compared to THM. A pin count, now more commonly called a component lead count, is the sum total of all the component leads that can fit on a PCB. SMT methods can achieve higher production volumes than THM, allowing for economies of scale that result in lower per-unit costs. SMT’s only financial disadvantage is that the capital investment needed to set up the machinery and production process are higher than THM. Another SMT disadvantage is that the level of design, production, skill, and technology needed to implement it is much more advanced than THM. Given the demand for ever-smaller designs, it should now be clear why at least 90% of all PCBAs are made with the SMT method. However, THM will remain the better choice for certain specific applications, and some applications may benefit from a fusion of the two processes. Freedom CAD’s PCB design and engineering services could be the solution you’re looking for. 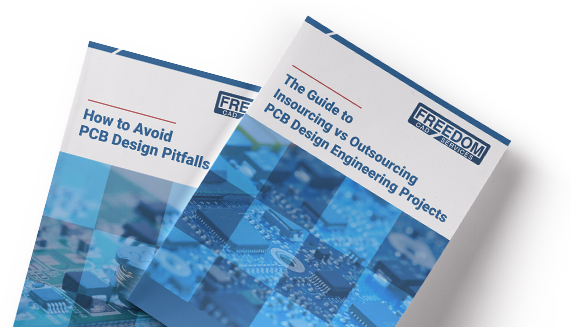 To learn more about PCB manufacturing processes, download our eBook, Insourcing vs. Outsourcing Your Next PCB Project. Next:Why Use High Density Interconnect?